Since their inception in the mid 1930s, trampolines have truly revolutionized exercise, sports, and backyard entertainment. Their use in circuses, carnivals, and other theatrical spectacles has added tremendous entertainment value, and their application for training in gymnastics, high-diving, and extreme sports has extended the limits of possibility. Trampolines come in various shapes and sizes. While circular trampolines are fine, rectangular and square trampolines can be a better solution in many instances. Not only do they sit flush against corners and walls — be they your exterior house walls, a backyard fence, or even a shed or garage — but they also comply with Olympic standards, which use rectangular trampolines due to their spaciousness and added bounce. In contrast to their round counterparts, the best rectangular trampolines are typically used in commercial applications. They must withstand more force than round trampolines, and as such are more expensive. But if you seek the highest bounces and longest hang times, rectangle trampolines are your best bet. Measuring in at 9 feet wide by 17 feet long, the Texas Competitor Rectangular Trampoline provides a wide area (84 square feet to be exact) to execute jumps, tucks, twists, and aerials of all kinds. The frame is made from thick gauged steel, and can withstand pretty much anything you can throw at it. It uses 96 8.5″ springs to propel jumpers to maximum heights. Weather you’re jumping for fun or practicing for gymnastics, cheerleading, or another sport, the Permatron Trampoline Mat has a bursting strength of 750 pounds per square inch, capable of holding the heaviest of bouncers. American made with a lifetime warranty, this system surpasses all ASTM requirements, exceeding the industry standards in a variety of categories. It can come with or without the safety enclosure, but we suggest paying a little extra for the added safety. Texas Trampolines also offer 15’x15′, 15’x17′, 10’x10′, and 13’x13′ options, so whatever space you have, they have a trampoline that can fit it. Oldzon’s 7×10 foot rectangular trampoline is the perfect option for smaller-sized yards. Yet despite its size, the trampoline still packs quite the punch. Featuring a polypropylene jumping surface attached to sixty 7-inch springs, this bad boy doesn’t mess around when it comes to generating serious air time. Environmentally-friendly safety pads cover the springs, protecting them from the weather while protecting you from them. Oldzon’s patented enclosure net is made from high-strength polyethylene, using an easy access door to make entering and exiting the enclosure as easy as pie. Galvanized steel is used to construct the trampoline’s frame, incorporating a special W-leg design to keep the unit sturdy and stable. It is certified to hold up to 200 pounds, a great solution for tight backyards! It should be noted, however, that the total area is 7×10, the actual jumping area is less (approximately 6×9). The new Icon Air 16 Sport HD is built with a safe, functional, and stylish design. Its sleek, all black look with blue accents and edging is modern yet timeless; a refreshing change from other trampolines that target children with the aesthetics to match. To combat the forces generated by high-flying jumpers, Acon uses a reinforced, heavy duty frame. When coupled with the strategically optimized spring placement, the system becomes insanely rigid, ensuring that no momentum is dissipated or lost when jumping. And to top it all off, the trampoline package contains ground anchors to affix the unit firmly to the earth. The rig has no single-user load limit. Many users buy it for their kids, but end up using it just as much themselves. Keep in mind, however, that the thick frame makes the trampoline quite heavy and difficult to move. So think long and hard about where you want it before you commence the construction process. All of Upper Bounce’s trampolines are easy to assemble and take apart, without the use of complicated hardware or the need for special tools. It’s frame is constructed out of durable steel, with welded sockets to hold the upright enclosure poles, preventing twists and strengthening the connection points. These safety poles also bend at the top — to keep the Terylene mesh net tight and out of the way — and sheathed in foam sleeves that are wrapped in a vinyl covering — to improve safety and increase the longevity of the poles. Zippers and latch clips are used for the net opening, making it secure and safe. Furthermore, the net is designed in such a way as to eliminate the dangerous gap that exists between the enclosure net and the jumping surface, keeping arms and legs as well as hands and feet from penetrating the gap and getting twisted up in the springs. Speaking of springs, the heavy duty, galvanized springs used by Upper Bounce provide unrivaled elasticity, with a total weight capacity of 500 pounds! The springs are covered by a multi-level foam and plastic pad, incorporating shock-absorbent, closed-cell EPE foam as well as PVC and PE thermosetting plastic polymers. For their jumping mat, Upper Bounce uses a woven polypropylene mesh with eight-row stitching, making it extra secure and preventing rips, tears, and abrasion. As one of the bounciest trampolines on the market, the only thing limiting your bounce height will be your nerves! Figuring out the best rectangular trampoline to meet you and your family’s needs can be a challenge to say the least. While quality is obviously important, so too is price. Durability and strength are essential, but safety is the most salient need that most prospective trampoline buyers seek to fill. But with greater risk comes greater reward, a fact that has propelled individuals to seek the highest-flying trampolines to achieve their lofty goals. Why a Rectangular Trampoline Over a Round One? Both round and rectangular trampolines have their respective pros and cons. Consequently, what works perfectly for your neighbor down the road may not be the best option for you. So what’s the deal with rectangle-shaped trampolines and how do they size up to their circular counterparts? To start, let’s take a quick look at the physics behind the “bounce zone” — don’t worry, no math is involved. The geometry of round trampolines is such that when a force is applied (i.e. you jumping on the mat), the springs stretch in a symmetrical manner. As such, there is only one major bounce zone on a circular trampoline, and that zone is directly in the center. When you bounce anywhere else, some springs are fully loaded but others are not, so you’re not getting the full force of each and every spring. A rectangular trampoline, on the other hand, provides a more equal force distribution throughout the jumping surface, so there is no single major bounce zone. The bounce on rectangular trampolines is more consistent, regardless of where the force is exerted on the mat. This is why professionals use rectangular trampolines as opposed to circular ones. If you’re in search of a good trampoline for beginners, novices, or young children, the strength, price, and bounce height produced by a rectangular trampoline will likely be overkill. If, however, you’re looking for the best way to train for cheerleading, gymnastics, wakeboarding, basketball, snowboarding, or countless other sports and activities, a rectangular trampoline will provide you with a bounce amplitude that is second to none. The bounce on rectangular trampolines is also softer. Unlike on round trampolines, where every spring is engaged on every jump simultaneously, springs on rectangular trampolines activate one after the other. For example, if you’re jumping in the center, the springs placed on the center will activate first, then the ones further along the sides, and finally the ones on each end. Jumping around on a trampoline is a great way to blast your cardiovascular system, build leg strength, and tighten your core. It is relatively low impact, engaging your entire body without putting stress on any specific body part. Unlike regular gym routines, trampoline exercises are fun and exciting, making you want to do them day in and day out. Here are a few examples of the various types of exercises you can execute on a trampoline! Upper Bounce operates under the guiding principle “focus on your customer and everything will fall in place”. And it is this commitment to excellence that has pushed them to develop some of the finest products you can find on the market today. They understand the health issues plaguing the United States today, and realize that exercise is paramount. Through their various trampoline lines, they seek to promote health and fitness for individuals of all ages, while ensuring the safety and longevity of their products. Founded by a Finnish renegade using money acquired through student loans, Acon breathed its first breath of life in 1996, when founder Tarmo Sallinen brought the first shipment of trampolines back to Finland. Since that fateful year, Acon has continued to grow and expand, reaching new levels and shattering limitations. It’s brand is commonly associated with extreme trampolining, and the world’s first quad backflip — four backflips in a single jump — was performed on an Acon trampoline. Q: Why are rectangular trampolines more expensive than round ones? A: Due to their shape, round trampolines disperse force evenly throughout the unit. This is not the case with rectangular trampolines, which have to be built much stronger than circular trampolines. They require thicker frames, heavier springs, and a more durable jumping mat, and are therefore more expensive to produce. Q: Can you put a rectangular trampoline on uneven ground? A: Placing a rectangular trampoline — or any trampoline for that matter — on an uneven surface is not advised. It would put unnecessary strain on the frame, and make bouncing more difficult and dangerous. Theoretically, you could shorten or lengthen the legs to make the jumping surface even on unlevel terrain, but this is not advised either as it would void your warranty wouldn’t be worth the work. A much easier solution would be to just level the ground underneath the trampoline. Q: Can you put rectangular trampolines in the ground ? A: Yes, in-ground rectangular trampolines are quite common. 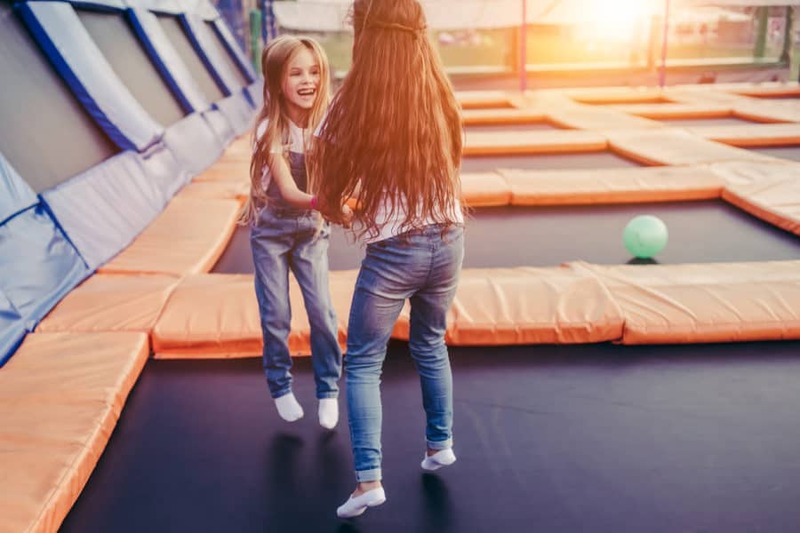 Although it does require a lot of digging and a bit of technical know-how, in-ground rectangular trampolines can add safety, convenience, and aesthetic appeal. We wouldn’t suggest, however, to retrofit an above ground trampoline. There are many companies and brands (such as Jump Power or Avyna) that build trampolines specifically for in-ground use. Weather your training for a sport, trying to lose weight, or simply looking for a fun way to stay active outdoors, a rectangular trampoline is a great option. And when it comes to rectangular trampolines few do it better than Acon. Not only are their units stylish and safe, but the bounce they provide is unrivaled. They lead the industry in terms of design, using optimized spring and pat dynamics that combine and synergize to provide a truly unique jumping experience. They aren’t the cheapest option, but as they say, you get what you pay for. And when you’re flying through the air, I think you’ll feel secure knowing that you went with Acon for your trampoline needs! Want more game ideas? Read 105 Backyard Games right here.